Woke up in Osaka, caught an early couple of trains to Kyoto, put my bags in a locker (they both fit into one of the 400 yen lockers, yay!) and spent a few hours wandering around. This time in Kyoto was a better experience. As I wandered up to kiyomizu, the shops weren’t even open yet. The temple itself was mostly covered up (renovations I guess) but the other buildings were nice. I went into one that was pretty freaky. Basically, you had to take your shoes off, then you went down to the basement. There, it was “very dark” indeed, as I’d been warned. Holding onto a hand rail of beads, I couldn’t see a thing. 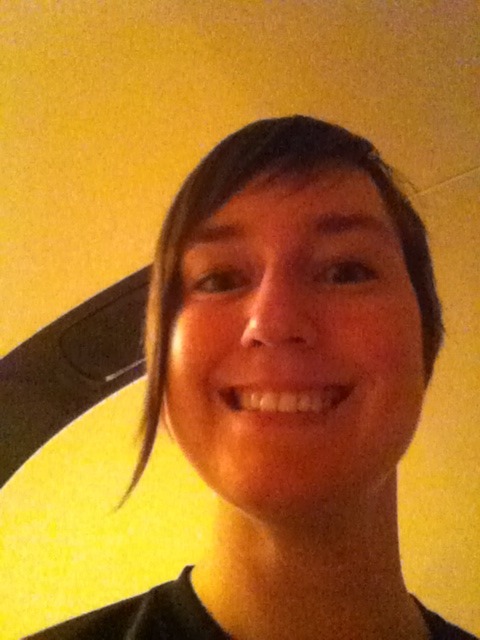 I wasn’t sure how high the ceiling was, so I was holding one hand out in front of my head, and I was pretty uneasy. Nobody else was down there. What had I gotten myself into? Then, I heard a group of high school kids coming, so I waited for them (and I think scared them, since they didn’t know I was down there). I wasn’t in the pitch dark part of it. Anyway, I went in after them. Their shrieks and laughing lightened the mood significantly. In retrospect, I probably should’ve gone in on my own, as that was supposed to be the experience, but oh well. Anyway, we eventually followed the railing around to a place where a light was shining onto a stone. You were supposed to make a wish while spinning the stone or something. 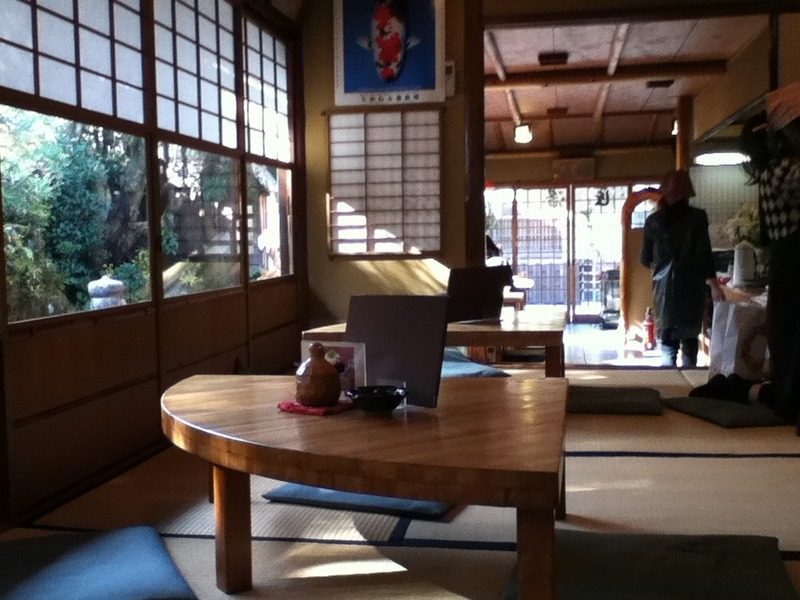 After I was done at kiyomizu, I went in search of a teahouse that was in my guidebook. Eventually found it and had some macha with really weird mochi stuff. It was glorpy and served with one pointy chopstick for stabbing it. I didn’t really care for the tea or the not very sweet sweet, but now I can check that off the list! It wasn’t an actual tea ceremony, but I didn’t really have 2 hours to spend on one, anyway. Back to Kyoto station, grabbed some ramen, and got on the bullet train to Nagoya, then transferred to a slower train to Nagano, and from there to a slower train yet to yudanaka. Yudanaka and my lodging is quite the culture shock from Osaka. 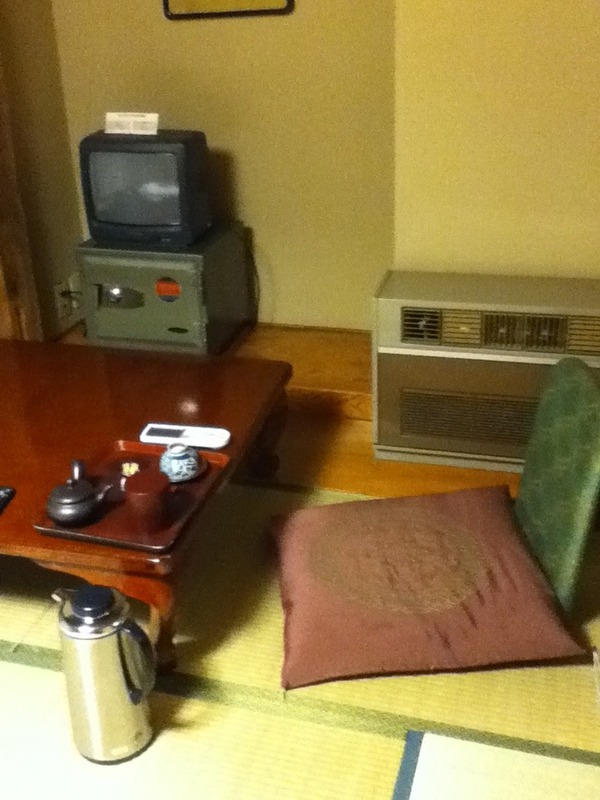 It’s a pretty small town, and my room is in the traditional Japanese style — tatami floors, futon on the floor, table about a foot off the ground, etc. It’s not a nonsmoking room, but it doesn’t smell. The proprietor is an interesting character. When I got in, he started telling me what I would be doing. Breakfast at 8am, then he’d take guests up to monkey park at 8:30, then we should take the train to another town for lunch, then to some hot springs by 5pm to catch the sunset. Sounds like a plan, he was just rather regimented about it. He wanted me to check out their bath before dinner, tonight, but I opted to wait. No point in getting warm only to then go freeze again! 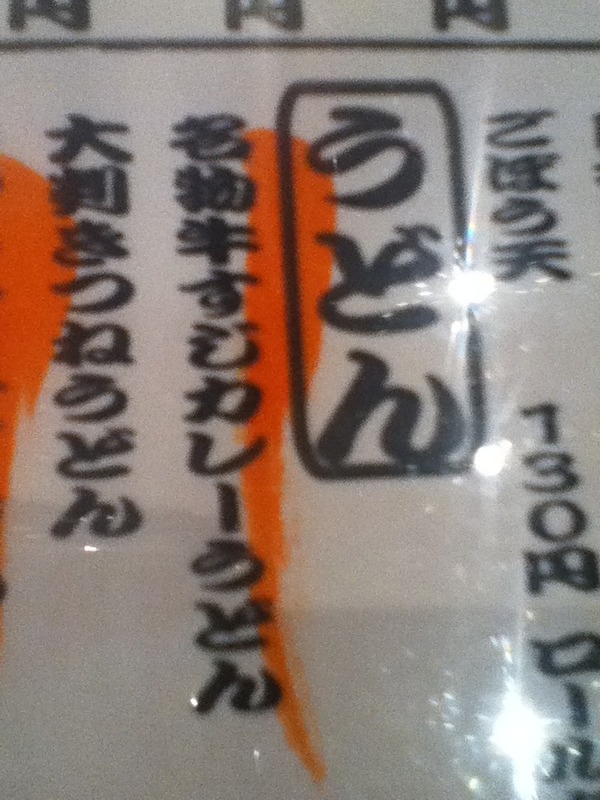 For dinner, I went to the only open restaurant I saw between the train station and the hotel. I’d actually peeked in on my way up, wondering if it was the hotel. At dinnertime, it was full. Pretty much all older men, most of them smoking cigarettes right next to me. And I think I ate nemo, tempuraed. Whatever it was, was smaller than the shrimp and had a tail. I’d been told to skip Osaka because there was nothing to see here, that it was just a big city. It’s true that there aren’t many tourist attractions, but that’s fine by me. 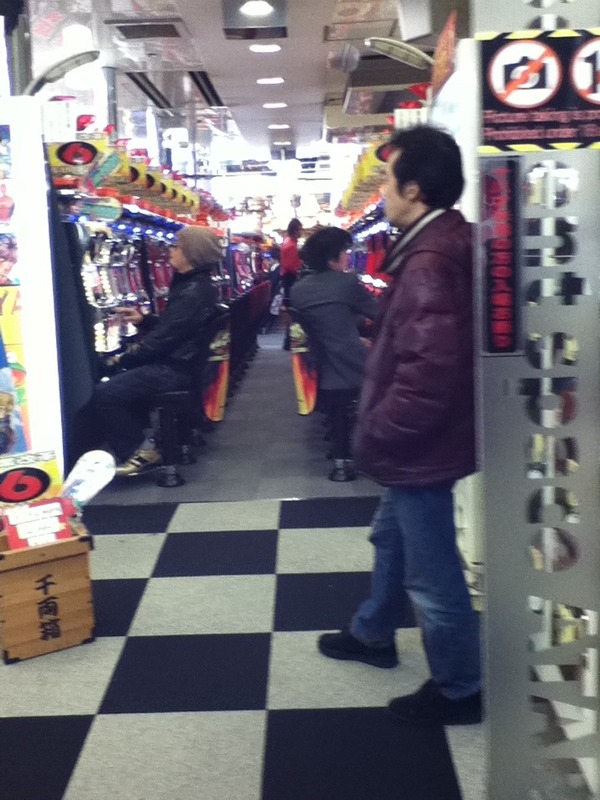 I was happy to just wander around with the throngs of Japanese who live here. Today was pretty laid back. 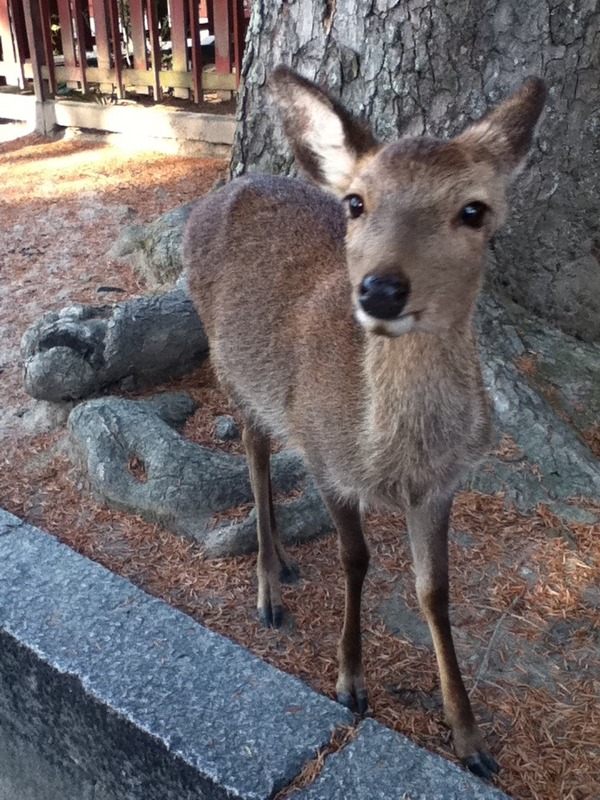 Took the train to Nara, hung out with Phil and a bunch of hungry deer and thectourists happy to feed and pet them. It still seems weird to me that these deer aren’t afraid of people and don’t really seem “wild” anymore, but as Phil pointed out, at least they’re not trapped in cages (or worse). I guess it’s good that they’ve learned to adapt to life in such a developed country. I guess there are worse things than being hand-fed cookies made just for you. 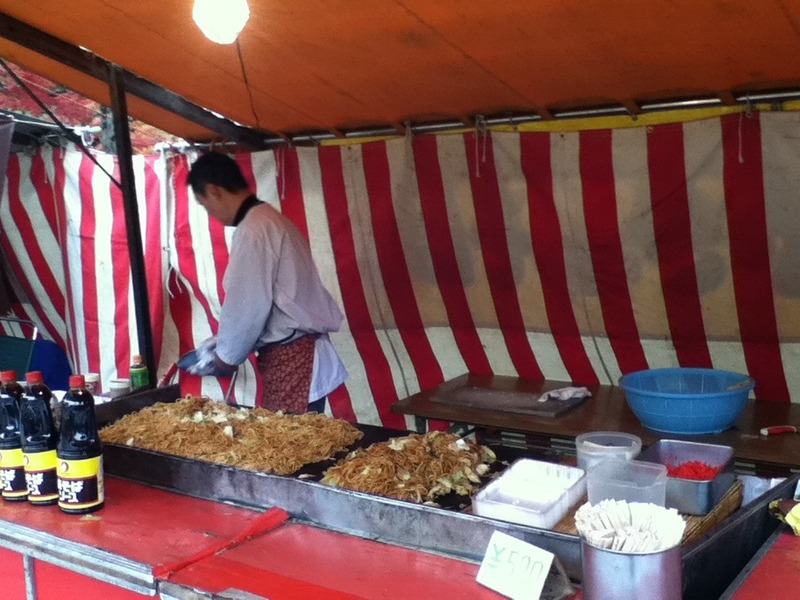 I had a variety of food from the street vendors, including teriyaki sauce covered mochi, tako-something (balls stuffed with octopus), and yakisoba. 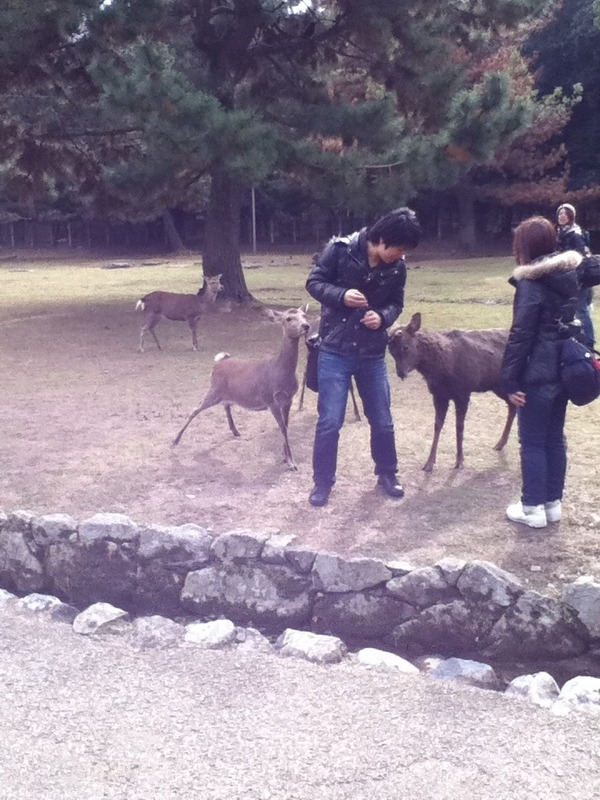 The deer didn’t get any food from me. 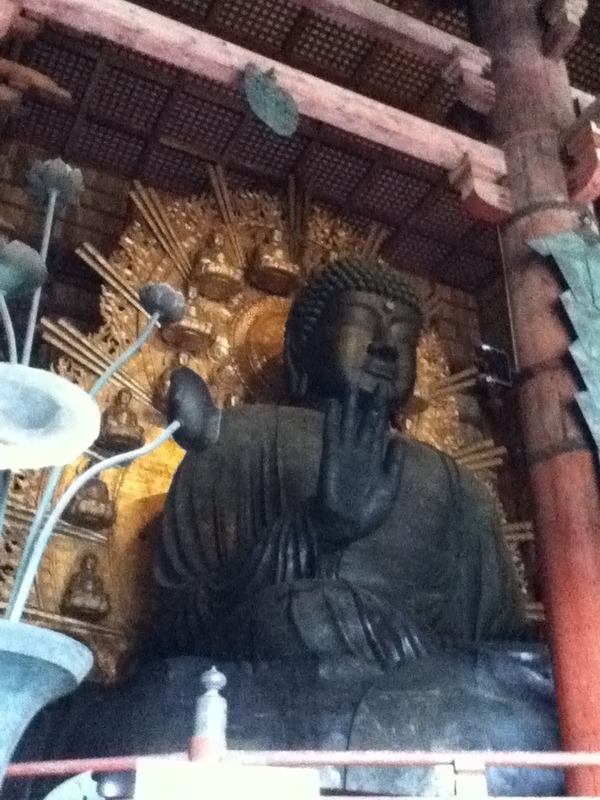 Besides the deer, the main attraction in Nara is a giant wooden temple with an enormous Buddha inside. Pictures don’t really show just how large it is. They also don’t capture the smell of incense in and around the temples. After I’d had my fill of Nara and it’s tourist traps, I headed back to the Guesthouse Yougendo to drop off Phil and pick up my bags. Then I headed into Osaka and got a taste of crowded city life while dragging my bag through a busy subway station and down a busy sidewalk. And this is just a Sunday night! 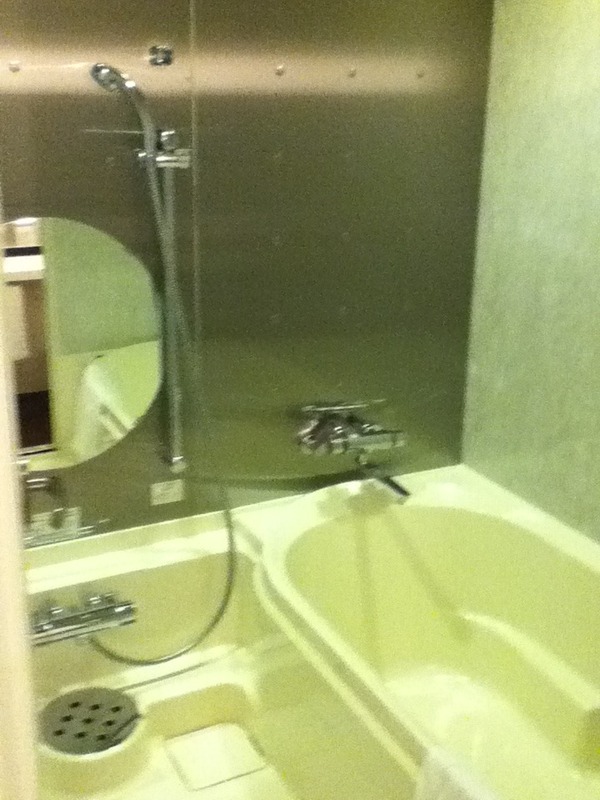 I guess the Hotel Cross was out of single rooms, so they upgraded me to a double. It’s nearly the size of a standard US hotel room. Huge by Japanese standards. Only downside is that it’s only on the 6th floor, and faces the street. As I write this, I can hear a jazzy brass band playing Christmas tunes. Hope I’ll be able to sleep later. Oh, and no wifi (at least not in the rooms). All that said, I’m excited to check out this neighborhood. I spotted a stand-up noodle shop counter and a couple walking streets with lots of shops and restaurants. Update: since my hotel in Osaka doesn’t have wifi, I’m posting this from just outside the apple store, the next day. And I slept fine. The band stopped playing and then it was just standard city hum. Today was a nice lazy day doing laundry (after getting a random nearby store clerk to help me choose a detergent without bleach), and just wandering around Osaka. 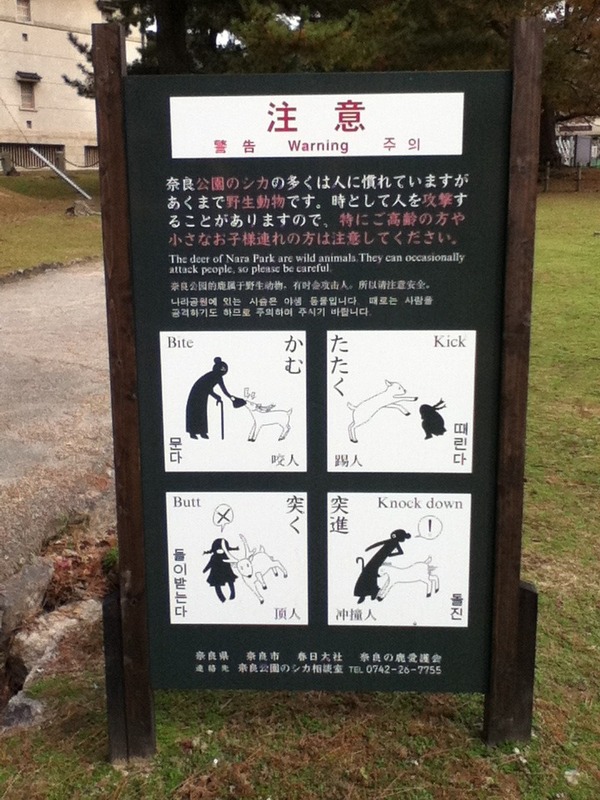 Tomorrow, I’m off to Kyoto for the morning, and then on to Nagano area for snow monkeys! 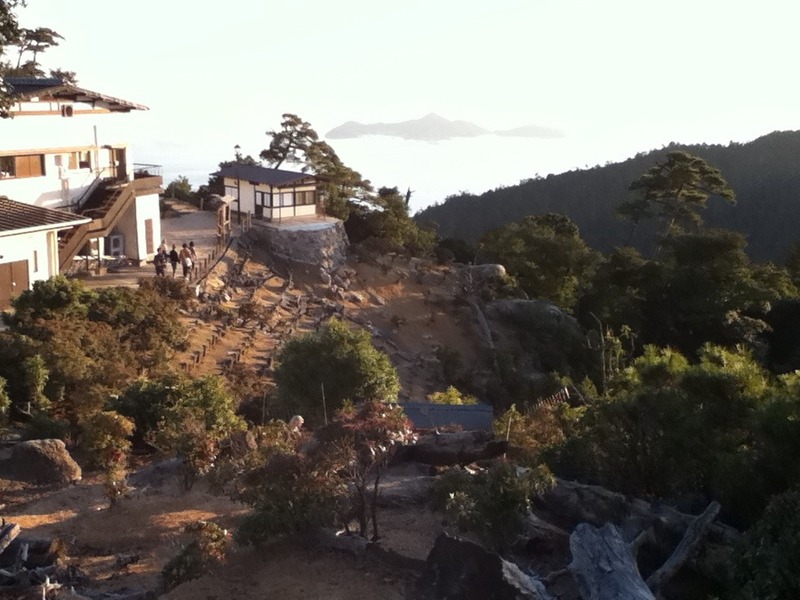 One of the other guests at Yougendo was headed up to mount koya (Koyasan), and invited me to join him for the day. He’d finished the pilgrimage walking between the 88 temples on Shikoku a few days ago, and wanted to go up to Koyasan, which is traditionally the final stop on the pilgrimage. I had actually considered staying at a monastery up there one night, but wound up ruling it out because it had sounded too out-of-the-way (among other reasons). Hearing that it could be a day trip, and happy to have some company, I decided to go. On the ~2 hour train ride, I heard a bit more about his trip, some of the characters he’d met, and stories of his fights with a neighbor’s pet kangaroo while growing up in Australia. Entertaining stories to say the least. 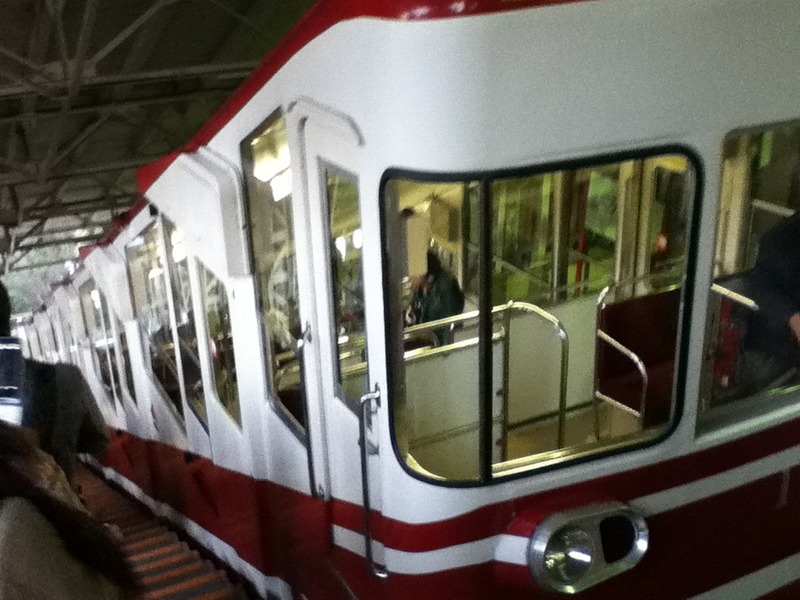 To get to Koyasan involved taking 2 trains, a cable car (at such a steep incline that the car was stepped inside), and a bus. 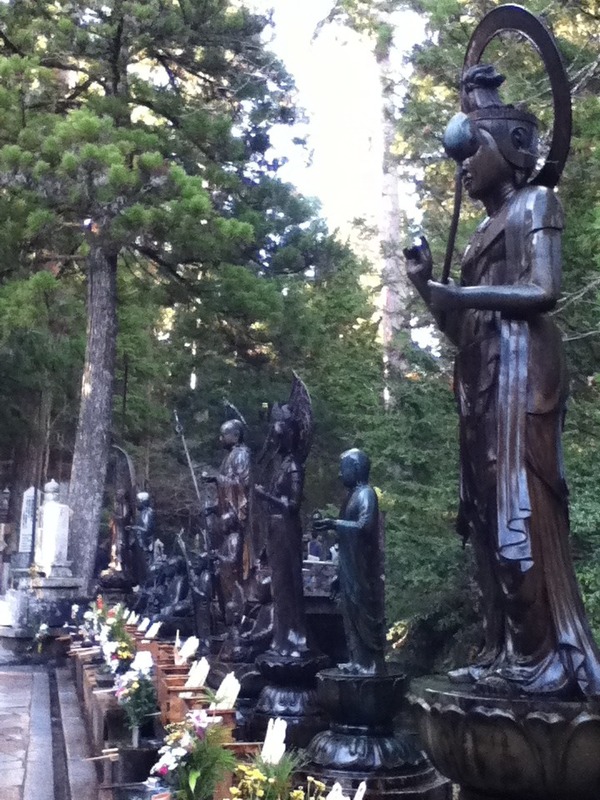 Once there, we wandered through a really cool cemetery on the way to the temple. Phil had learned quite a bit about the various Buddha statues in the course of his journey, so he was able to help explain a lot of the things we saw. For example, the bibs on some buddhas and hats on others (an expression of piety and remembrance for stillborn/lost babies, and acts if piety done out of consideration for the buddhas in the cold, respectively). The older part of the graveyard was really neat, with huge trees and mossy covered stone monuments. The newer side had shiny markers, and one had a rocket(!?) In the old section, there were a few new plots/monuments as well — including one shiny one for the Panasonic corporation. The town itself really thrived on the visitors and pilgrims. Phil put it well after we saw $60 vegetarian lunches in one window — it’s a 1000(+) year old tourist trap. 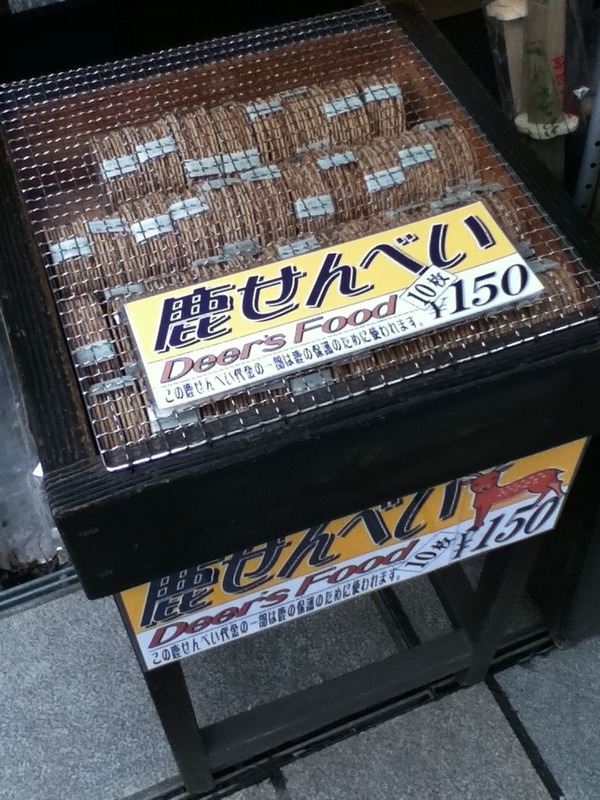 We found another place just down the street with a similar kind of food but much less expensive. 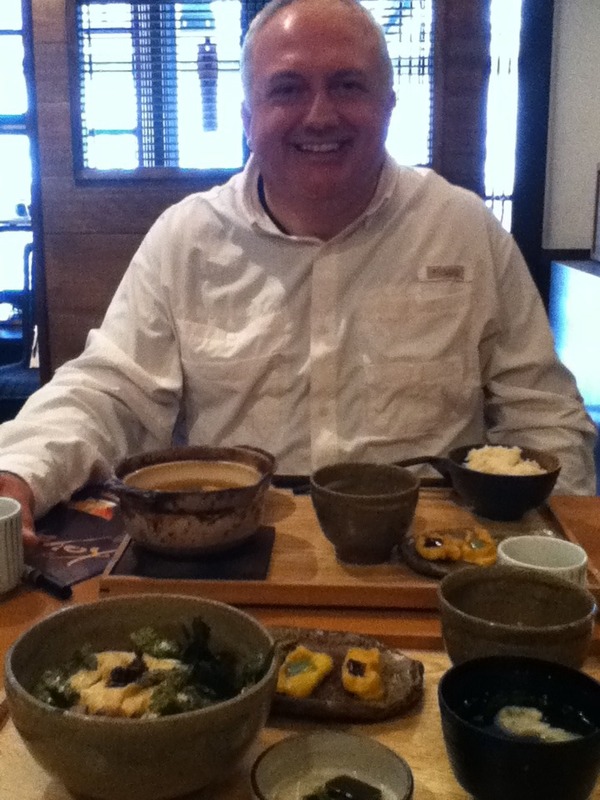 I had a rice dish with “mountain vegetables” which included something that reminded me of fiddlehead ferns. All very tasty. Dinner was a collection of interesting and as-yet-untried foods from the supermarket across the street, shared in the kitchen at the guesthouse, where the staff were also having dinner (tacos). Tomorrow, I’ll spend the day in Nara and then head over to Osaka. 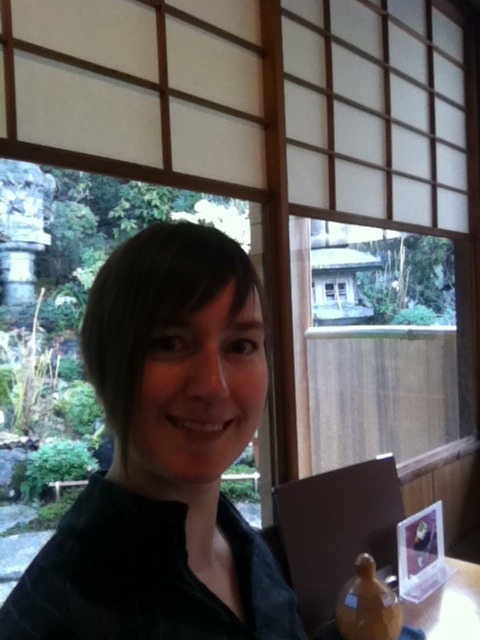 First impressions of Kyoto…touristy! Don’t get me wrong, I’m sure there are a lot of great sites and sights, but I miss the vibe of Hiroshima or even Tokyo, where the tourist to local ratio was better. It didn’t help matters that I joined a tour group for a morning tour. 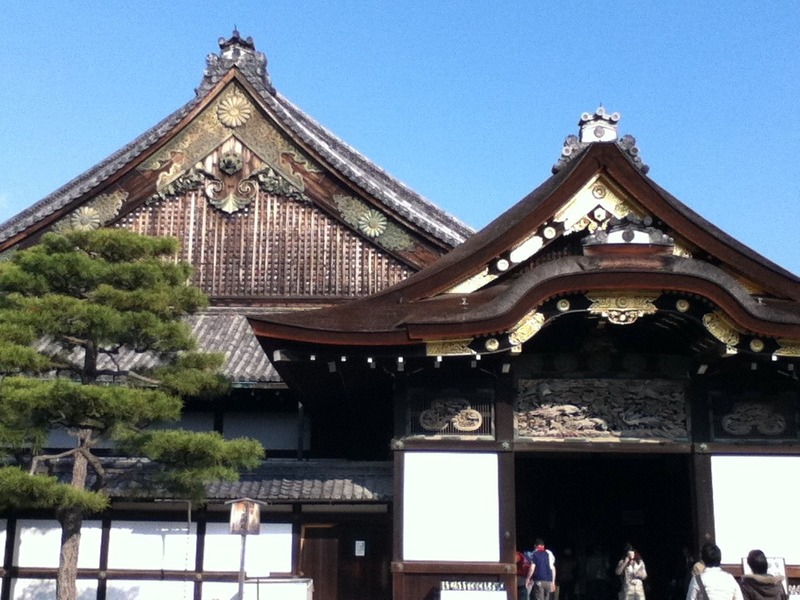 I did get to see a few important sites (Nijo castle, Golden Pavillion, and the Imperial Palace). 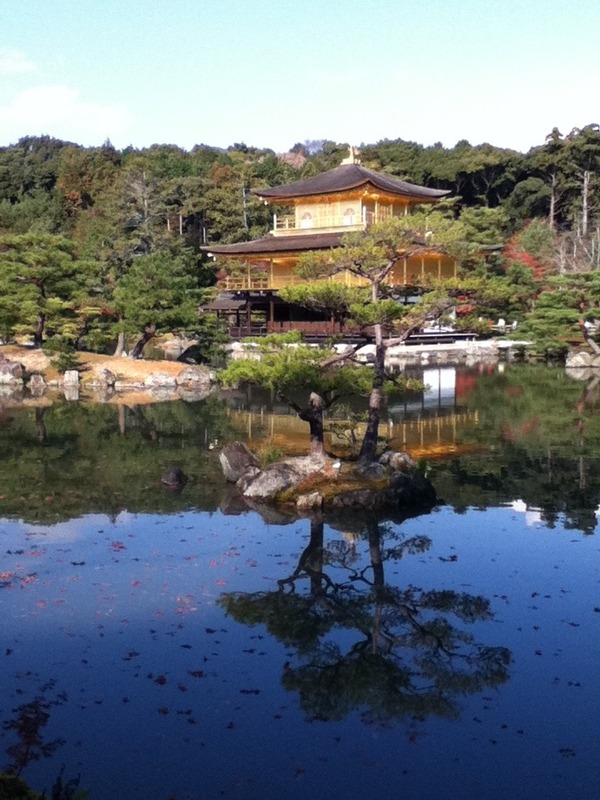 Of these, the golden pavilion was by far the most impressive. Or at least the shiniest! 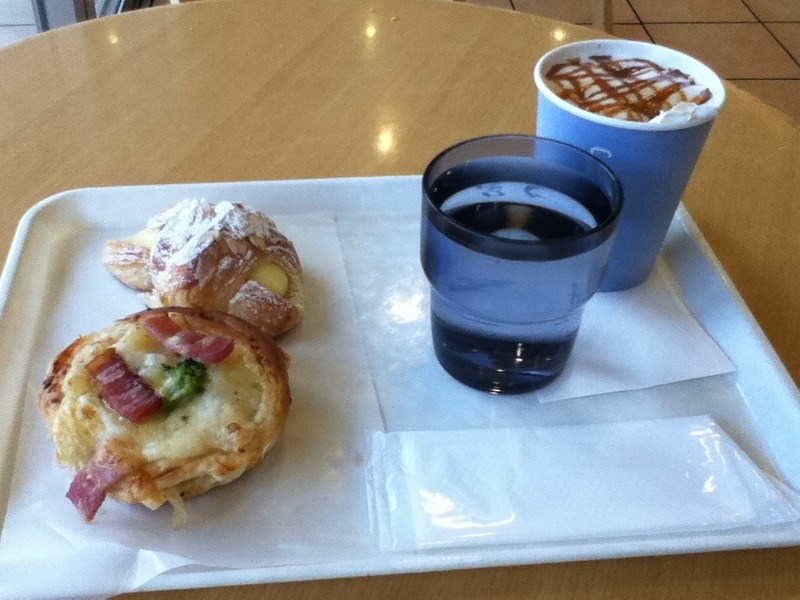 Afternoon, I headed for Oji. 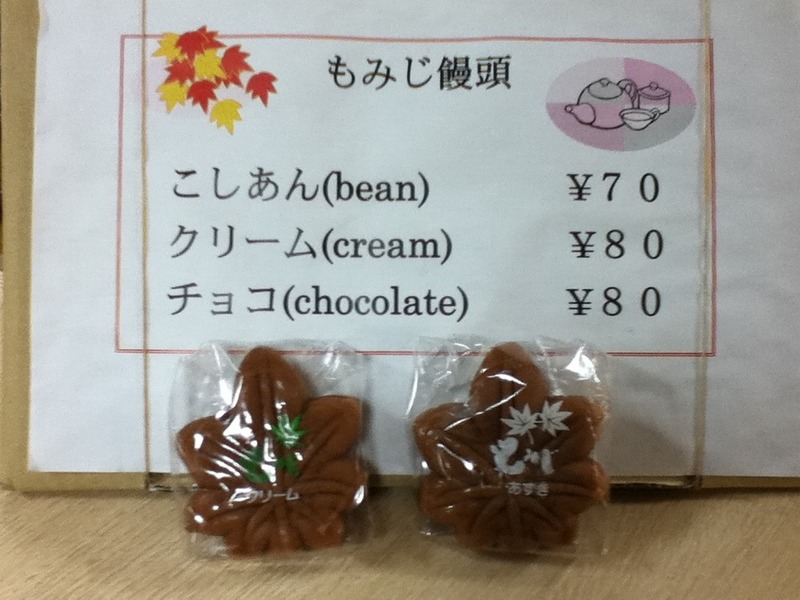 Note that Oji and Uji are two different places! People in Kyoto know about Uji but not Oji. After a few wrong trains, I made it to Oji and Guesthouse Yougendo. Met some of the other guests (all Aussies but for one girl from Taiwan). Not many pictures on the iPod from yesterday. Spent most of the day wandering around Hiroshima — a beautiful garden, Hiroshima castle (reconstructed) and Peace Park and the museum there. It was an appropriately gloomy day. After finishing up at the museum, I walked a few blocks and wound up in a vibrant and busy stretch of shops and restaurants. The city has most definitely rebuilt itself. 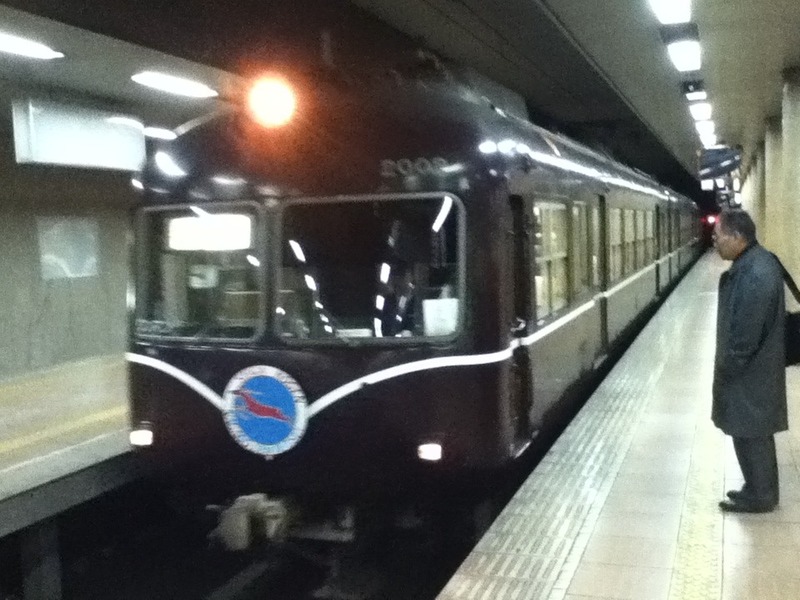 Then, back to the train station for a train to Kyoto, and I checked into the capsule hotel (http://9hours.jp/top.html). It wasn’t too bad. 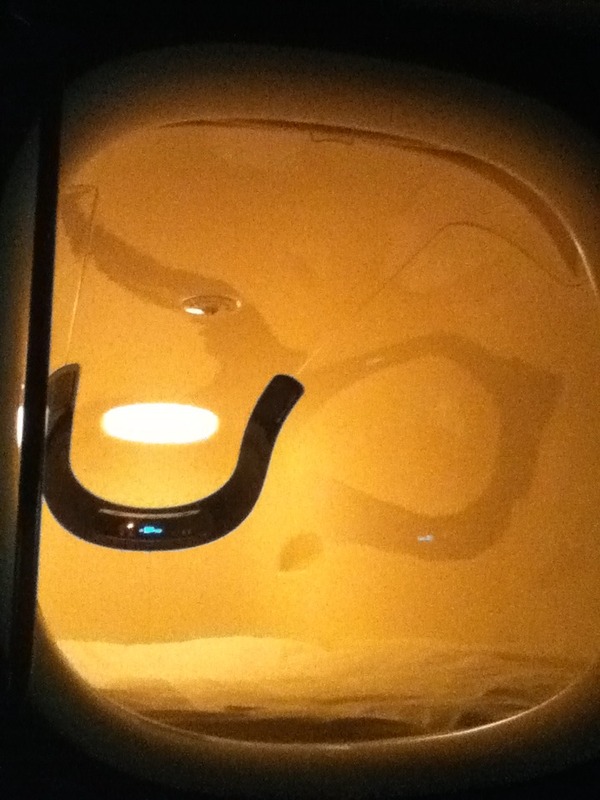 I could sit up inside the pod and had several inches to spare above my head. It didn’t feel claustrophobic. Only complaints were that the pillow was buckwheat or something and not very comfortable, and that it got a bit warm in the pod with the curtain closed. Dinner last night was at a restaurant with no English or pictures, but I sat at the counter and ordered some skewers like what I saw being made. One was asparagus wrapped in bacon, the other was scallop (I knew the word for that — hotate — from sushi menus in the past). They were battered/crumbed and deep fried. 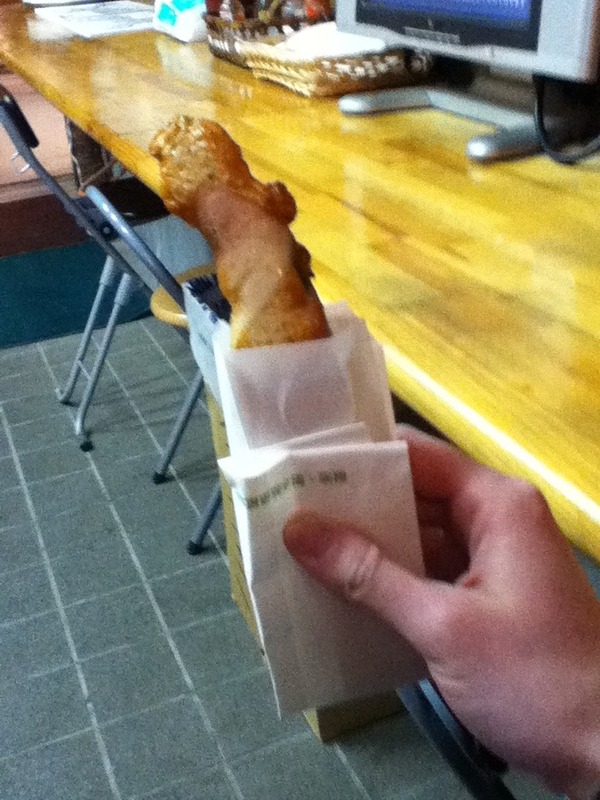 Deep fried bacon. 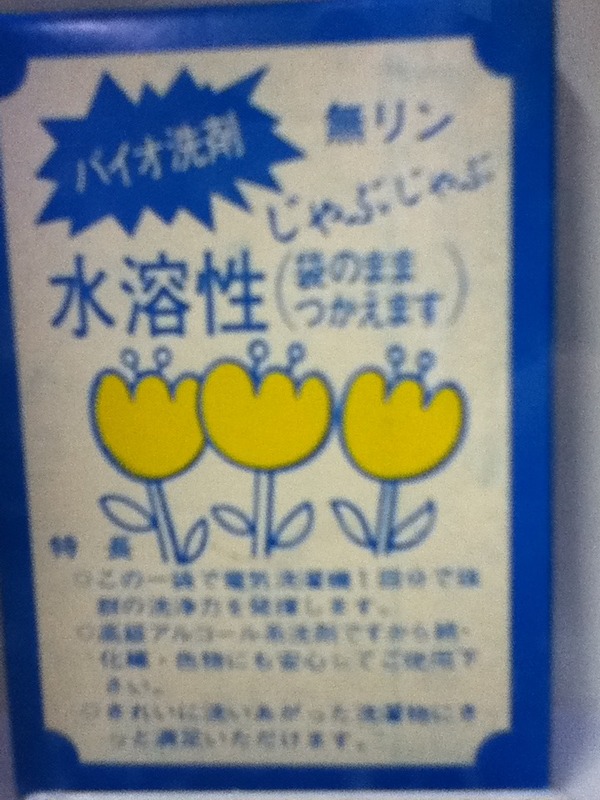 But it’s Japanese, so it’s good for me! Also had curry udon with beef upon the waitress’ recommendation. 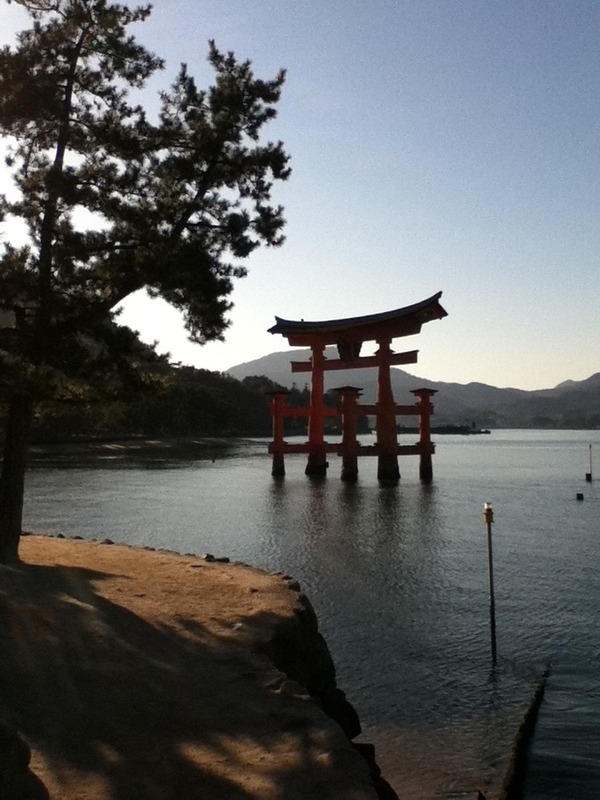 Today, tour of Kyoto in the morning and then off to Nara later. Took the train from Tokyo to Hiroshima, checked into my hotel at the train station, then hopped a local train and ferry to Miyajima. 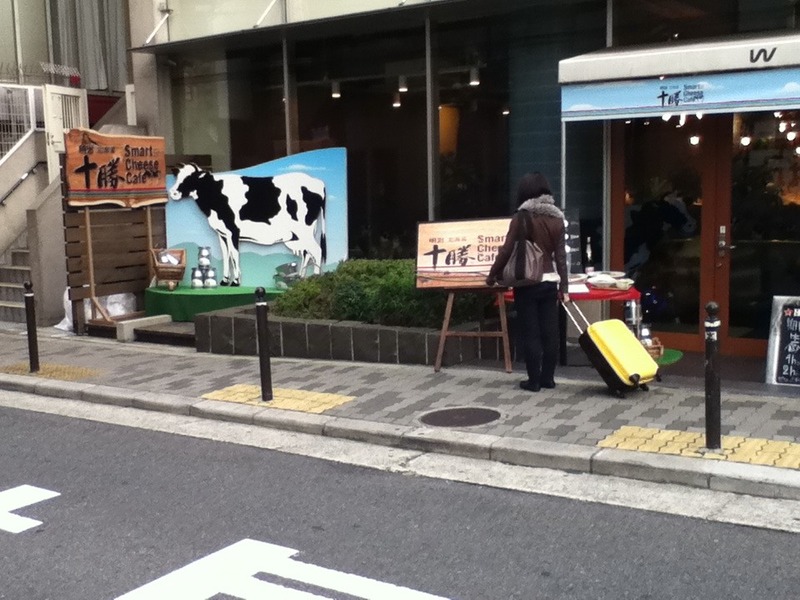 See pictures of island, shrine, and funky foodstuffs (I tried the maple leaf shaped pancake sweet filled with bean and one with custard, and something wrapped in bacon). 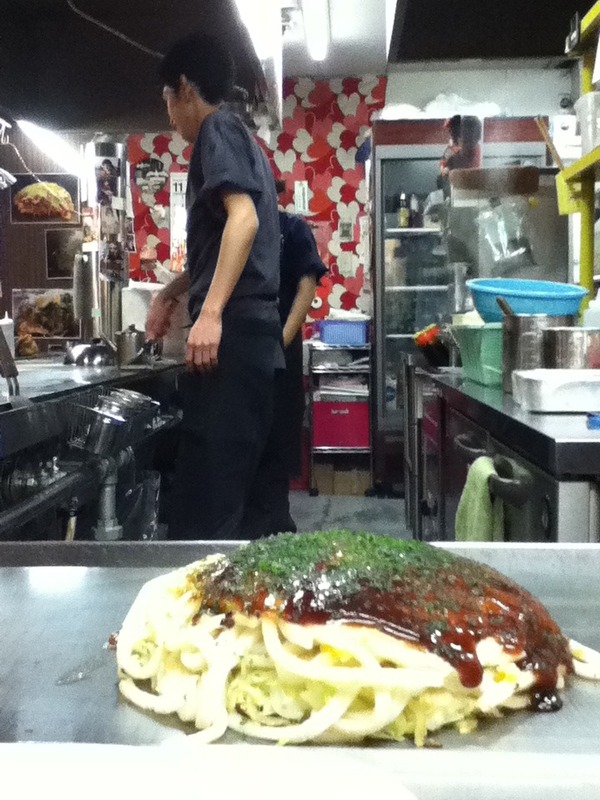 After getting back (after dark) I went to a local place specializing in okonomiyaki (something like a crepe with cabbage, bacon, egg, noodles, and sauce).